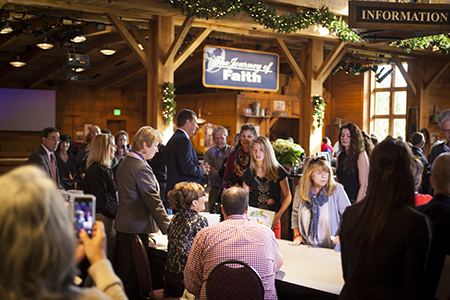 Former vice presidential nominee and Alaska Governor Sarah Palin signed more than 800 copies of her new book "Good Tidings and Great Joy," at the Billy Graham Library on Dec. 6. In 2010, Palin and some of her family members traveled to Haiti, where they visited a Samaritan’s Purse cholera clinic and helped distribute Operation Christmas Child shoe boxes. In 2009, Palin visited Billy and Franklin Graham at Mr. Graham’s Montreat home in the North Carolina mountains. Some of the people waiting in line were giving signed copies of the book as Christmas gifts, like Alan Suggs. Suggs, a Charlotte-area National Guard recruiter, stood in line wearing his fatigues. A 10-year Army veteran, including one tour of duty in Iraq, Suggs was getting a signed book as a gift to his father. He said his father is a great admirer of Palin, but so is he. Charlie, a young man standing in line to greet Palin, had met her several years ago in Florida. Like Palin’s youngest child, Trig, Charlie has Down Syndrome. He made such an impression on Palin, that she even mentioned him in her first book, Going Rogue. The Palins subsequently corresponded with him via telephone and email. And so today, Charlie came, anticipating a brief reunion with her. When He reached Palin, she immediately recognized him. She stood up quickly and enthusiastically asked him to come around the table for a hug. Charlie is not the only one who walked away from this event with a positive feeling. 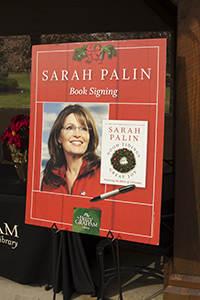 Christmas at The Library continues at The Billy Graham Library through Dec. 23.